by Alexandra Schexnayder, Article donated by the mane points horse resource center . Typical list of daily activities for pleasure riders: Provide fresh water, check. Look for ticks, check. Pick hooves, check. Get involved in politics - whoa, Nelly. All uncharitable comments about the similarities between government and mucking out aside, if that last item took you by surprise, one Deep South equestrian suggests it's time to re-examine your duties as an owner. "No one is out there lobbying for the rights of the backyard horse owner, so it's up to you to ensure you don't lose riding opportunities," says Clemson University's Gene Wood, founder of the Southeastern Equestrian Trails Coalition. Wood admits would-be trail riders have a tough road ahead of them. "South Carolina's Mountains-to-Sea trail is currently 280 miles long," he says. "Only 17 of those are open to horses." 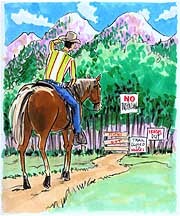 It's not just his home state that has a dearth of public land available to the horse and rider. "There is no place in this country where there aren't problems between riders and land managers. In fact," he adds, "the number of problems is increasing all the time." Land management agencies, such as those that oversee state and national parks, have a singleminded purpose: Protect the land. That may or may not be in conflict with the trail-riding goals of horse owners. "Land managers and lawmakers usually aren't horse people," notes Helen Koehler, one of Florida's most prominent horse-owner activists. "They see a big animal and think that it's going to wreak havoc wherever it goes. That's why we need to spend the time it takes to show them differently, to educate them. Because many, many times, their fears are completely unfounded." Not always. Wood, a professor of forest wildlife ecology and Extension trails specialist, is quick to point out that many times, horses can cause damage to forests and streams. Can't gain access to public lands in your area, no matter how hard you lobby? Helen Koehler takes another trail through the government maze. "Buy and build your own trails," the Florida activist advises. "Here in Florida, we hold competitions, clinics and rides to raise money. We're in a serious trail-building mode, currently buying up old rail trails, and it takes cash to make it happen." Not that it's always horse-owners' cash. "We just completed a project called The Land Bridge, a series of trails over I-75. And we did it with federal ISTEA money--almost $4 million-worth," says the savvy strategist. "Some riders have very little sensitivity to the impact of their riding. They'll say, 'Oh, I'm careful,' as they're riding up and down the stream bank, causing erosion and contributing to sedimentation of waterways," he says. "The same is true of people who tie horses to trees--it can absolutely ruin the bark and gives parasites the perfect opportunity for an infestation that will kill the tree." These small infractions may seem minor. After all, a huge forest won't miss one tree. But rangers, land managers and your fellow taxpayers who use the forest will. "There are careless riders out there, and they are just ruining it for the rest of us," laments Wood. That's why the coalition seeks to educate not only non-riding government representatives, but also--perhaps especially--trail riders. "Horsemen must assume the responsibility for increasing their own awareness of natural resources and the impact of riding on those resources," says Wood. "If we want to continue to be able to ride the nation's trails, we have to do our part in seeking a harmony between using horses on public lands and natural resource conservation." Having horsemen and land managers reach an understanding is critical for riders: Land managers have all the cards in this deal; riders can only lose. "To the extent that agreement cannot be accomplished, I have absolutely no doubt that horses will be increasingly restricted," Wood concludes. "And if we're not currently allowed in a particular area, we will never have the opportunity to get in." Alexandra Schexnayder is marketing editor for Southern States Cooperative. Your tax dollars pay to maintain the parks system, so you ought to be able to ride where you want, when you want, right? Better rein that thinking back down to a walk. Nearly every national park has rules--which are enforced by federal fines--about equestrian activity. Many state parks are beginning to follow suit. Always check with a member of the park staff before you load Dobbin into the trailer. In general, however, if you apply the rules of common sense and good neighborliness, you should be fine. Plan on bringing in feed and water for your horse. Nearly all public lands restrict how close horses can get to water sources. Some parks, such as Redwood National in California, specify the feed allowed in: only pellets, cubes or certified weed-free hay will do. Never allow your horse to graze. Stick to trails marked for horses. Hiking trails can't accommodate horse traffic. Keep it slow--most parks don't allow any gait faster than a canter. Pack it in and pack it out. Plan on taking in everything you'll need, then removing it when you leave. That includes manure. Be sure you know where you may load and unload horses. Usually, it's not where vehicles are parked. Get a day-use permit if required. Limit the number in your party. Read the next horse riding tips article on Types of Horse Gaits.